Unsustainable agricultural practices remain one of the greatest threats to ecosystems and biodiversity. As the world population is expected to reach nine billion by 2050 and climate change further threatens livelihoods, we have to identify new, more sustainable agricultural practices that support both farmers and the environment we all rely on. The good news is many such solutions already exist at the community-level. 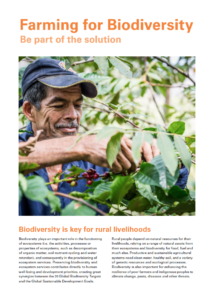 At the global level, the Convention on Biodiversity’s Aichi targets create a path towards the protection and sustainable use of biodiversity by 2020. Consumers are also becoming increasingly aware of how their choices are affecting the environment and the people who depend on it. Now, we must surface what works for farmers at the community-level and take these bright spots to scale. That is what our Solution Search: Farming for Biodiversity is all about. 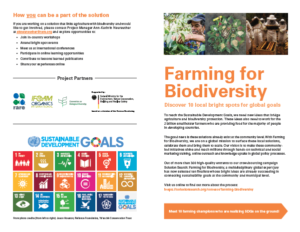 In 2017, we joined PANORAMA – Solutions for a Healthy Planet to showcase some of the best ways to connect agriculture with biodiversity. The first phase of the project is marked by the kick-off and execution of Solution Search, a global crowd-sourcing competition which seeks to unearth existing, replicable solutions and expand their reach across the globe. The contest also offers entrants additional opportunities to receive both technical training and funding in support of their solution. In addition to the competition itself, all entrants will be eligible to participate in the second phase of the project, which will spread the most promising and replicable solutions through in-country campaigning and technical trainings, delivered as part of a joint effort between IFOAM-Organics International and Rare’s Campaigning for Conservation program. The trainings and grants will empower local practitioners to raise awareness of the value of biodiversity and conduct social marketing campaigns promoting their solutions. 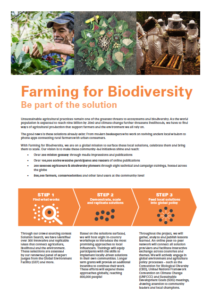 We are working closely with FAO and the Convention on Biological Diversity, as well as more than 30 partners from agriculture and land use, to ensure that lessons are taken up in policy and practice.